Footbinding was a very painful procedure that was practiced a thousand years ago in China . Footbinding was when they massaged both feet, filed them so the toenails woldnt go inside of the foot,broke all eight toes and folded them under the sole of the foot, they left the two big toes sticking up. this only happen to women and girls, usually and the middle or upper class. After they got their foot binded they slowly learned to walk again. They wrapped their feet with 10 feet bandages to stop the pus and blood. Since there was so much pus and blood it made their feet smell wherever they went. 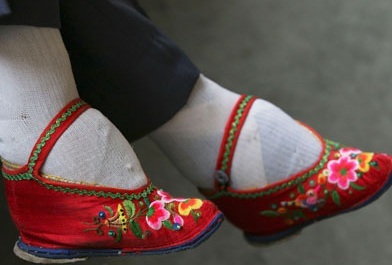 Foot binding was outlawed in 1911, but poeple in China still practiced it secretly. Today most people do not footbind, but and some places in China the ancient tradition is still practiced. Join in and write your own page! It's easy to do. How? Simply click here to return to Interesting Facts About Asia.